The Celebrity Almanac is a unique reference work that is a one-of-a-kind original concept. The book contains over 300 Celebrity Almanac Profiles ranging from contemporary personalities like Babyface to legendary entertainers like Jerry Lee Lewis. There is a section containing over 2400 celebrity birth dates in alphabetical order; a section containing over 700 celebrity death dates (recorded since 1982) and over 400 real names of celebrities; and a section containing 450 original autographs and photographs. In the Celebrity Almanac Profile section each celebrity has taken the time to fill out, personally sign and return a data form (questionnaire). This never-before published celebrity almanac information contains real names, birthplace, date of birth, favorite activities, favorite actors, movies, TV shows, songs, sports, etc. Of special importance are the original legacy quotes provided by each celebrity in their own words. The Celebrity Almanac offers readers up-to-date information on well-known personalities of today and yesterday. There will be great nostalgic value for the reading public to know "where are they now" on famous people like Fess Parker, Dwayne Hickman, Jane Russell and legendary coach John Wooden, to name a few. This publication contains, quite possibly, the last personal correspondence made available for publication by such celebrities as Ida Lupino, Wolfman Jack, Maxene Andrews, Audrey Meadows, Juliet Prowse, Robert Mitchum, Lloyd Bridges and Robert Young which was obtained just prior to their deaths. There is no other comprehensive celebrity reference work that includes first-hand information on so many well-known personalities. The Celebrity Almanac has four very unique sections of celebrity information. Section I. Features over 300 Celebrity Almanac Profiles on famous personalities in the entertainment, arts, literature, sports, business and political fields and is listed in alphabetical order. The data provided was furnished by each celebrity who personally filled out and signed a Celebrity Almanac questionnaire. (These personally verified and signed data forms provided the basis for the Profiles.) The form includes such authentic details as: date of birth, birthplace, birth name, first career break, most memorable career event, favorite movie, favorite actor and actress, favorite television show, favorite song, favorite food, favorite sporting activity, favorite leisure time activity, hobbies, most respected historical figure and a "Legacy Quote" written in their own words. Click [here] to go to Celebrity Profiles! Section II: Features over 2400 celebrity birth dates listed in alphabetical order. Click [here] to order now! Section III: Features over 700 celebrity death dates listed by year starting in 1982 and over 400 real names of celebrities listed in alphabetical order. Click [here] to go to Death Dates, Click [here] to go to Celebrity Real Names! Section IV: Features 450 original celebrity autographs & photographs. Click [here] to go to Autographs, Click [here] to go to Photo Album! 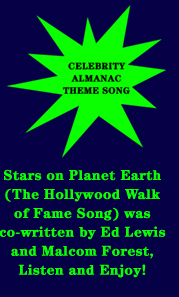 The wealth of fascinating information contained in the Celebrity Almanac will be of interest to the public, agents, entertainment executives and to the media who produce and broadcast celebrity programs. It is an easy reference book to look up interesting information about famous personalities including birth dates and death dates. This publication will provide hours of enjoyable reading to the public and will become the best-selling and foremost celebrity reference book in the United States.